A resident of New York City, Mrs. Diker is a dancer, mother, philanthropist, author and a graduate of Smith College. She and her husband are founding co-chairs of the Smithsonian’s National Museum of the American Indian in New York City. She is also a member of the International Advisory Council of the Smithsonian’s NMIA in Washington DC. 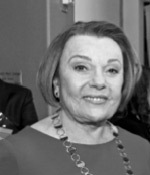 Mrs. Diker is a Trustee of National Dance Institute-New York, and the National Jewish Outreach Program. She has also served as Chairman of the Twyla Tharp Dance Foundation, Trustee for the American Ballet Theatre, and Chairman in charge of major gifts for the Harvard College Parents Fund, and was a founding member of the National Board of the Santa Fe Opera. She is a former member of the Alvin Nikolais Dance Company, and is the author of Journey to the Heart, a book of poetry, published in 1992. Recently, Governor Richardson has appointed her to the Commission on the Humanities of New Mexico.